It’s no wonder why Bernardaud china is by far one of the most innovative brands in French luxury tableware. 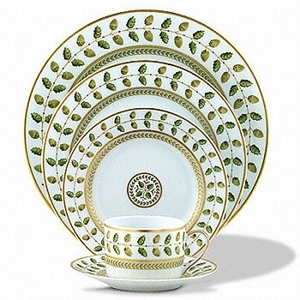 The Limoges France family owned company brings a tradition of excellence and evolution to its trendsetting blends of colors and patterns while providing a balance of classic and contemporary designs over their 150 year history. 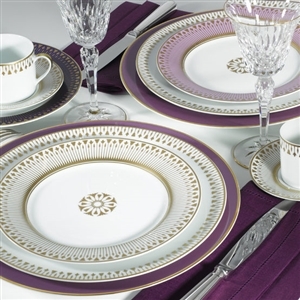 Bernardaud employs master craftsmen skilled in the great French porcelain tradition to create elegant collections that revolutionize entertaining with beauty and functionality. Bernardaud’s latest release of porcelain art for the tabletop includes four collections, The White table, The Classic Table, The Contemporary Table, and The Historic Table, each with their own unique fusion of integrated subsidiaries. Comprised of the Digital, Ecume Matte Rim, Fusion, Louvre, Naxos, and Organza collections, The White Table adds a modern chic ambiance to any dinner table or event. 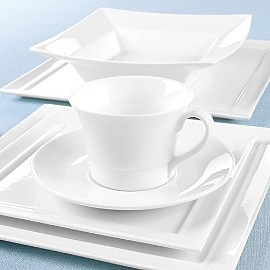 As its name suggests, every piece in this collection offers a unique spin on the classic all white place setting, popular in part to its versatility and its ability to coordinate seamlessly with both formal and casual stemware and flatware. 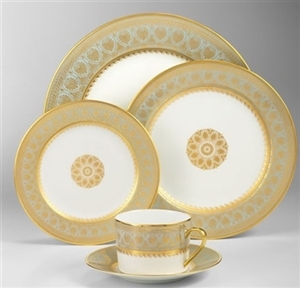 In these genuine Limoges porcelain dinnerware collections, you will find immaculate edges with molded finger impressions, hollow engravings, geometric shapes, and French Renaissance details that will see you through a lifetime of family dinners and parties with friends and neighbors. Take your table from ordinary to extraordinary with one of the six Bernardaud collections in The White Table available at Chelsea. Our favorites include the Oliver Gagnere designed Naxos, which uses sharp raised geometrical outlines to show contrasts and shadows on a canvas of white porcelain, and Organza aptly named for its organic and contemporary finish that favors the texture of woven fabric. The White Table furnishes a contemporary and minimalist experience using pure lines and genuine porcelain to create the perfect look and feel for any occasion. Ask any French woman and she will tell you that receiving guests around a dinner table for religious occasions, anniversaries, or other event is very much an important part of the culture and faux pas are not easily forgotten. The Classic Table collections of Bernardaud are crafted and created with such care that any one of its seventeen different tableware settings will cause a stir among friends and family for years to come. The Classic Table features collections that offer unique settings for guests whether it be a nod to the 70s with the Athena collection in gold, navy, or platinum or the Aux Oiseaux settings which displays colorful birds and butterflies perched atop hand painted branches. The Classic Table is not simply for the French; it houses something for everyone from almost every century. Visit our website for the full list of pieces available at Chelsea. If you are looking for a less traditional and more current place settings, Chelsea also has you covered with the Bernardaud Contemporary Table Collections. Like the Classic Table Collection, The Contemporary Table is composed of seventeen different dinnerware compilations each with its own style and feel. Here, you will find the continuation of Ecume in gold and platinum as well as the Oliver Gagnere designed Galerie Royale in Linen, Wallis Blue, and Orange. A few of our other favorites include Ultra, Taiga, Olbia, and Promenade. With so many options to choose from, you will be sure to find your next set of Bernardaud china from The Contemporary Table Collections found in store or online. The fourth set of the innovative and complex works from Bernardaud adorn hand drawings similar to those of the painters in the 1800s and is manufactured in the Former Royal Factory which continues to pass down traditional techniques since being founded in 1774 by Louis XVI. Created at the oldest existing porcelain factory in Limoges, you can expect perfection from every meticulously handcrafted piece in The Historic Table. The Historic Table contains a range of collections commissioned by Prince William II of Hesse in 1829 including the sophisticated Botanique service. For over two centuries it has adorned a single variety of flowers arranged in the shape of a crown with extremely rich hues, a characteristic yellow nankeen band decorated with a frieze of palm or ivy, and a central rosette. This extremely complex work also bears flowers and leaves of a single plant species represented in different ways depending on the location of the crown and are accompanied by painted rings on a white strip bounded by two threads of golden beads. The rich back story of The Historic Table is a rarity and indicative of its name is the only example of its type manufactured in such a historic location. Get obsessed with these amazing and unique French Limoges Porcelain collections today by visiting our website or store and let us know which ones (there will be more than one) are your favorite.